The amount of violent crime in the San Gabriel Valley’s three most populous cities dropped dramatically last year, reflecting a national trend, according to 2009 crime figures released Monday by FBI. All three Valley cities of over 100,000 residents — El Monte, Pasadena and West Covina — saw a drop in both violent and property crimes with one exception. El Monte property crime saw an uptick from 2008 to 2009. West Covina brought back a crime analyst in 2008, which allowed the city to aggressively target certain areas and criminals, Police Chief Frank Wills said. West Covina was also able to keep patrol officers on the streets, but had to cut its S.W.A.T. team to do so, Wills said. Murders in West Covina jumped from three in 2008 to eight in 2009. El Monte Police Chief Tom Armstrong said the drop in murders to three in 2009 from 12 in 2008 is proof that the spike was an aberration. Pasadena had five murders in 2009 compared to three in 2008. For more, read the story here. How far can a city go when it comes to code enforcement? How far can a city go to ensure neighborhoods and homes are uniform, clean and meet a general community standard? 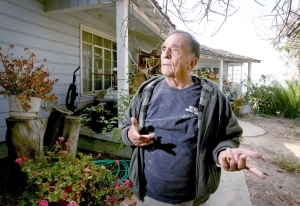 Richard McDonald, 76, has been fighting back against his city. His two-acre property has a $36,750 lien stemming from dozens of code violations he racked up over the years. Walnut is trying to recoup some of the money it spent trying to address his case. A city prosecutor charged he and his wife with 279 code violations and both were eventually conviction of 33 of those counts last year. McDonald admits to having had as many as 20 dogs, 15 cars and 200 pigeons on land which sits a top a hill on Camino de Teodoro. The city says neighbors have complained since 2003 about the appearance of the property, the smell and dogs. At the heart of McDonald’s challenge is differing opinions on property maintenance. He claims that no one has complained about his home since he moved there in 1972. “Beauty is in the eye of the beholder,” said McDonald, who retired in 1993 from 33 years of teaching at Fullerton College. For more on McDonald’s story read the rest here. Politics or sincerity regarding Azusa helmet issue? The issue dealt with an 8-year-old child who is in the hospital after he was struck by a car while riding his bicycle Friday evening. He was not wearing a helmet. I haven’t received an update today on the boy’s condition, but the last I knew he was still being treated in critical condition in the hospital. Two speakers during public comment directly spoke to the issue of helmet safety, City Council regular Mike Lee and former council candidate Paul Naccachian. Both speakers were critical of laws regarding helmets for children riding bicycles and asked for more efforts, stronger laws and raised awareness. When the council responded to public comments, Mayor Joe Rocha said the city has taken great efforts to provide helmets to residents who can’t afford them. But it was Angel Carrillo that added some political fervor. Being that Mike Lee isn’t a political candidate, it would seem the comments were directed toward Naccachian. If Naccachian runs again for council in March 2011, he would be facing off against Carrillo and councilman Uriel Macias. While he was critical of the council, his intent wasn’t too use the issue as a political maneuver, he said. The issue is one of importance to the community and his point was that work to date hasn’t worked, as evidence by the most recent accident.